Mrs. Yollis' Classroom Blog: New Collaborative Blog: The Reading Roundup! Mrs. Yollis and her students love to work and learn alongside other people. They've discovered that when you collaborate, everyone wins! 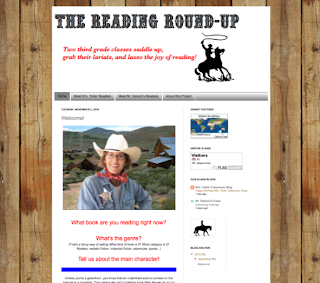 Today is the launch of a new collaborative blog called The Reading Roundup! This blog is open to everyone who loves reading! Here is the welcome video from Sheriff Yollis and Sheriff Salsich! Please pony up, and ride on over to The Reading Roundup! We'd like to know...what book do you have in your saddle bag? Parents, please recommend some good children's books you know! I go to Azusa Pacific University and today in one of my classes our professor showed us your blog. I think what you guys are doing is awesome and I wish I could of been blogging in 3rd grade. I also sent your blog to my girlfriend who wants to be a elementary school teacher, hopefully she can be as cool as Mrs. Yollis someday. Nice job. Keep up the good work. Sheriff Mrs Yollis and Sheriff Mr Salsich do hope your horses are behaving back at the homestead. I just loved your video and I thought you might be interested to hear what book I have got stored in my saddle bag. It is called Wild Swan. Its about the history of China in the twentieth century. Wild Swan takes you on an adverture, and courage of one family over three generations. This family is extraordinary as they share a wonderful love and respect towards one and other. For life was tough back then. from your blogging friend down under AA. I watched the video it was awesome. The book I have in my saddle bag is Diary of a Wimpy by Jeff Kinney. The main character is Greg Heffly which he is bullied by his older brother Rodrick. I am going to describe what Greg's life is about. Greg is wimpy. He's best friend is Rowely. Rowely is crazy but he loves playing games. I hope you like my information about my book in my saddle bag. Thank you for your fabulous comment. Yes the horses are behaving very well! 1.First, it was used for a blanket. 2.Next, the quilt was used for a table cloth. 3.Also, it was used for a chuppah. A chuppah is a cannopy under which the bride and groom get married. What does down under mean? Wow I love the the post of the reading round up because you get to talk abnout what kinds of books you are reading. I'm reading Forever Amber Brown. Amber Brown is a good book because Amber's mom can not decide if she should marry her boyfriend Max. I suggest some of these books Judy Moody and Amber Brown books they are very silly because there is a resturunt called Say Cheese. When you where young did you read Forever Amber Brown? Thankyou for your wonderful reply back to me. I really like the review you gave on The Kipping Quilt. I will have to look out for this book and put it in my saddle bag to read. You asked me a very interesting question regarding the term down under. It really is a term used to describe Australia. As Australia is located at the bottom of the world globe and so therefore the word down under began. That was a great video ya'll made! You asked what book I am reading, well I have two more chapters in Charlie and the Chocolate Factory. That book has 155 pages, and 30 chapters. The book I have in my saddle bag is Beezus and Ramona. It was made into a movie that I have not seen. I think it is realistic fiction because everything that happens could actually happen. Beezus and Ramona are two sisters that argue often but still love each other. It reminds me of my sister, Leila, and me! What do you have in your saddle bag? I just love, love your Reading Roundup! What an exciting way to learn about new books. Right now, I'm reading Eat, Pray, Love by Elizabeth Gilbert. In it, a woman travels to Italy, India and Indonesia. While I read it, I pretend that I'm in Italy with her eating some great food. I can almost taste the pizza now. When I was teaching 4th grade, two of my favorite books were The Stranger by Chris Van Allsburg and Stone Fox by John Reynolds Gardiner. The Stranger is a picture book about a mysterious man who comes to town and stays with a family. No sooner than he arrives, strange things start happening near their house. I love this book because the illustrations are so beautiful and the author makes the reader decide who the mysterious stranger could be. I like books that make you think. Stone Fox is a chapter book about a boy who enters a dog sled race in order to win prize money and save his grandfather's farm. I love this book because it's a story of love, determination and loyalty. The boy in the story loves his sled dogs and I'm also a softy for dogs. I could go on and on about some of my favorite books. I'm thrilled that I can share my book collection with Tucker and Bennett and eventually with Lawson and Keaton. Reading is so much fun; it's like a movie is playing in your head, only better! I'm wondering if any students have ever read either The Stranger or Stone Fox? My favorite children's author is Chris Van Allsburg. Who is your favorite author? I really enjoyed watching the roundup video! It is so much fun to read! It is always much more fun to read a book than watch the movie based on a book! Books are filled with such rich details. I personally love reading murder mysteries....one of my favorite authors is Nelson Demille. If you like murder mysteries, you will love Nelson Demille's books! Kristen and I often sit together and read our books. I read my murder mysteries while Kristen reads her Judy Moody books by Megan McDonald. Reading is one of our favorite hobbies! long, and thoughtful comment! I think I will love to read those stories. I am anxious to read both books after hearing the title. I am reading Harry Potter.It is a great book. I'm up to the 10th chapter. The author is J.k. Rowling. Is the book Stone Fox sad? My ranch was called the Lazy Daisy Reader.I could not sit still long enough and reading one paragraph, without daydreaming, was a challenge. The only person who was going to improve me was Me.I took the challenge. I moved down the road to a different homestead,the Bookworm Ranch. I thought Tucker's response, to Catherine's favorite stories, was well written. Collaborative Roundup is a great Blog.I hope to write a story someday. Does writing appeal to anyone else? blogging skills. You are a great member of our blog! Do you have any more books in your saddle bag? I have recently read a very interesting nonfiction book geared more for the adult audience. It is called Freakonomics by Steven Levitt. The book attempts to answer modern cultural questions using economic/statistical theories and analysis. What I found especially interesing is that for the same question, different authors can reach different conclusions using what appears to be similar "sound" statisical analysis. Another acclaimed economist and author Malcolm Gladwell in his book The Tipping Point: How Little Things Can Make a Big Difference comes to a completely different conclusion than Steven Levitt for why there was a decrease in crime over the past couple of decades. Freakonomics is by no means a book about crime in America, but rather covers a wide range of topics applicable to today's society (e.g. patterns of baby names, home prices set by real-estate agents, cheating on tests and other topics). Malcolm Gladwell authored another interesting book within the same genre titled Blink. Of the three books mentioned here, I would recommend one start with Freakonomics as it is probably an easier read and then move to the other two books if your interest is peaked. Freakonomics was listed at number two among nonfiction on The New York Times Best Seller list. One interesting fact, is that the book gained in popularity in part due to blogging. The authors created a Freakonomics blog and invited famous guest bloggers to comment on pertinent issues. I like books by Cynthia Rylant especially the Cobble Street Cousins Series. She wrote about 2 sisters and a cousin who stayed with their aunt and had interesting adventures. My favorite part of the book was when the sisters and cousin helped introduce the aunt to her future husband and then helped plan the wedding. I hope someday I will be a flower girl in a wedding too. I have been curious about that same question.I keep coming back to Robinson Crusoe. This was way back in 2nd grade. I believe I identify with that character the most. I even named my Irish Setter Friday. Your Dad may remember her. Adventure,survival,island living and friendship,I know no bounds to my imagination with this one story. Pippy Longstockings, Danny and the Dinosaur, Peter Pan and a set of the World Book Encyclopedias would be in my saddle bag. Guess I'll need more horses. Care to tell me a story around the campfire tonight? Anyone else want to join up? Eat,Pray,Love is a great story. I really related to Elizabeth, when she took the challenge to shut her brain down.Repeating a mantra works. Sleep does not come easy when your brain wants to run down a check list. Does eating your way through Italy sound as great to you as it did to me? Today my saddle bag is filled with cookbooks. I bought my Slow Cooker recipe book through your school's fundraiser. My grandson earned 3 credits and your school gained some needed dollars.I was happy to help and better yet, the grub I rustled up was greatly appreciated by the trail boss. This was a perfect example of a collaborative roundup. We all won. Did the Uganda children get their playground land? Oops! I wrote Keeping Quilt wrong. I thought the term Down Undermeans Down Under the ground in Australia. I think the Reading Roundup is a great idea. I am always looking for new books to read and recommend for my book clubs. I also enjoy hearing about books that Andrew and I can read together. Last night I just finished 1000 Autumns of Jacob de Juet. It takes place in the late 1600s and early 1700s. It is about life in Japan for a the members of a dutch trading company. While I didn't love the book, I found it intriguing from a historical perspective. Andrew and I just started reading Spy Dog Superbrain by Andrew Cope. It is the fourth book in the British series about a dog that solves crimes like James Bond. I look forward to hearing what other students and adults are reading. Grayson, Alie and Ruth are going to learn all about blogging tomorrow. We are going to tell you about our favorite books!! I am reading Henry and Mudge Puddle Trouble. In the story Mudge eats a blue flower and then Henry gets mad at him. I really like the story. I think when you were acting, you were incredible. Acting must be hard especially trying to give an expression to the audience that it is the Wild West. The movie is humdinger. Books are great so I just went to the Book Fair and bought two books. The books are "Bakugan Ultimate Handbook" and "Dude - The Book of Crazy, Immature Stuff!". I think the reading roundup will be a great blog for everybody. I think the reading roundup is a great way to expand the scope of the 3rd grade blog by including reviews of books for all ages. I really enjoyed reading through the comments. I spend a lot of time on airplanes and am always looking for good books to help pass the time. Currently I am reading Moloka'i. It's a beautifully written book about a young girl and her experiences living in a leprosy settlement in Hawaii. It's based in historical fact so it's a peek into a world I would otherwise know nothing about. As a reader, I'm curious what other readers think about the movement towards e-books with readers like Kindle and Nook? I love to relax with a book and just don't think I will have the same emotional connection with an electronic device as I do with a published book. As a traveler I see how it could be move convenient but I just can't get myself to make the switch. What do others think? Wow! that was an amazing post about the reading round up. I am reading The Lemon Tree. The genre is nonfiction. It is about two families who lived in the same house at diffrent times. Ilove it. I'm planning to read The Confession. The author is Grisham. I like his books,he writes a lot. I am Leah from Mrs. Ranney's class. I watched your slideshow. It was super! At this moment I am reading Clementine #2. It is a great book. The genre is realistic fiction. I'm Jordyn from Mrs.Ranney's class.I really like your slideshow! Right now I am reading Franny K. Stein Mad Scientest Attack of the 50-Ft. Cupid.The genre is Science Fiction.It is a fantastic book!